Holiday Travel Bargains? It’s a Christmas Miracle! As promised in my earlier Thanksgiving column, I’ve selected several Christmas travel quandaries from readers in need of my help. Since I wanted to apply extra time and energy into each question, I’ve divided my column into two parts. So, hold onto your seats for more Christmas-related travel next week, but for now—on Dasher, on Dancer, and on to this week’s dilemmas! Though I would love to send you to Berlin for its Christmas markets or Paris for its cafes, your dates make it a bit hard when it comes to saving money. So, to be on the thrifty side, I have chosen a place a bit closer to home—yet still in a different country. 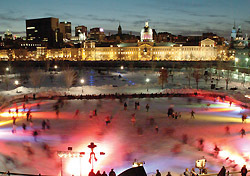 Montreal, in my opinion, is a glorious combination of French culture with a Canadian setting. The city captures the feel of Paris, while still being accessible to those who can’t cross the Pond. Plus, I can tell you that I have spent several days there as a single gal and never once felt unsafe. Since I don’t know exactly where you’re coming from (I suspect Seattle), I searched flights from there for your travel dates. I was able to find tickets starting at $515, including taxes and fees. However, Air Canada offers several sales on flights to Montreal at different times throughout the year, so be sure to check there first. As for places to stay, the city is filled with options, ranging from hotels to apartment rentals. You can save a little extra on a hotel with the tourism board’s winter sweet deal, which offers half-off second-night stays starting at $127 CAD (about $103 U.S.; check XE.com for current exchange rates) per night. If you would rather stay somewhere a bit homier, you can choose from several different B&B’s starting at just $50 CAD per night. Plus, you’ll get breakfast each morning, and the chance to meet fellow travelers. The other option is my personal favorite, and when I go to Montreal I never miss the chance to feel like a local by renting my own apartment. One-bedroom rentals start at $85 U.S. per night, and typically come equipped with a kitchen for cooking. When it comes to things to do, the city is a smorgasbord of activities, attractions, and restaurants. You could spend your entire vacation wandering just Old Montreal, with its unique little shops and cafes that line cobblestoned streets. However, you would miss out on all the other diverse neighborhoods, each offering insights to the culture that makes Montreal such a delightful place to visit. While searching for the perfect location for a family your size, I’ve been softly humming to “grandmother’s house we go.” And though you may not be staying home, I think San Diego is the ideal location for you and your family. Not only is it warm and doesn’t require a passport, it also offers something for people of all ages. I’m especially thinking of SeaWorld, LegoLand, or Disneyland. You and your troop can also save on cash by spending your days relaxing on the beach or exploring the many shops and restaurants in the downtown area. You were right in your initial assumption that airfare may be the most expensive part of your trip, especially for this many people. I found flights from Dallas to San Diego for your dates starting at $320 (including taxes and fees) per person on [[American Airlines | American Airlines]]. If you really want to save money, you can always rent two minivans for 11 days (each fitting seven people) for about $496 from a company like Avis, and then drive the 1,360 miles each way, or roughly 20 hours, to San Diego. Gas will cost about $125 per vehicle at $2.00 per gallon at 22 miles/gallon. The total would be about $1,250 one-way, but the time spent driving may not worth be the savings. The one area where I know you can really save is on lodging. I recommend a vacation rental close to the beach or all of the attractions. With a company like HomeAway, I was able to find a six-bedroom home that sleeps up to 18 people for $3,995 per week. The grand total for 10 nights comes to $5,707, or about $570 per night. That’s a good value when you consider how many hotel rooms (even 10 people would probably require five rooms) you would have to rent each night. Plus, you can save on food by cooking in your rental, which I assume could help out a lot when feeding so many people. There’s still more to come next week, so be sure to check back for more holiday sleuthing. Plus, if you have any suggestions for either L Duncan or Single in Seattle, please feel free to comment below.